Grain size distribution, porosity, and hydraulic conductivity were determined for 39 sediment samples collected from ephemeral streams (wadis) in western Saudi Arabia. The measured hydraulic conductivity values were then compared to values calculated using 20 different empirical equations commonly used to estimate hydraulic conductivity from grain size analyses. It was found that most of the hydraulic conductivity values estimated from the empirical equations correlated very poorly with the measured hydraulic conductivity values. 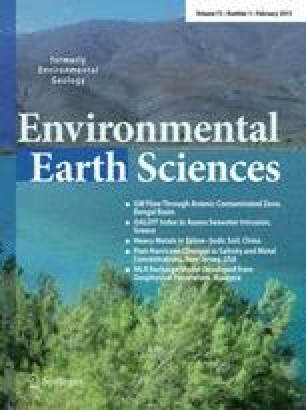 Modifications of the empirical equations, including changes to special coefficients and statistical offsets, were made to produce modified equations that considerably improved the hydraulic conductivity estimates from grain size data for wadi sediments. The Chapuis, Hazen, Kozeny, Slichter, Terzaghi, and Barr equations produced the best correlations, but still had relatively high predictive errors. The Chapius equation was modified for wadi sediments by incorporating mud percentage and the standard deviation (in phi units) into a new equation that reduced the predicted hydraulic conductivity error to ±14.1 m/day. The equation is best applied to ephemeral stream samples that have hydraulic conductive values greater than 2 m/day. The funding for this research was provided by the Water Desalination and Reuse Center and faculty discretionary funding by the King Abdullah University of Science and Technology.